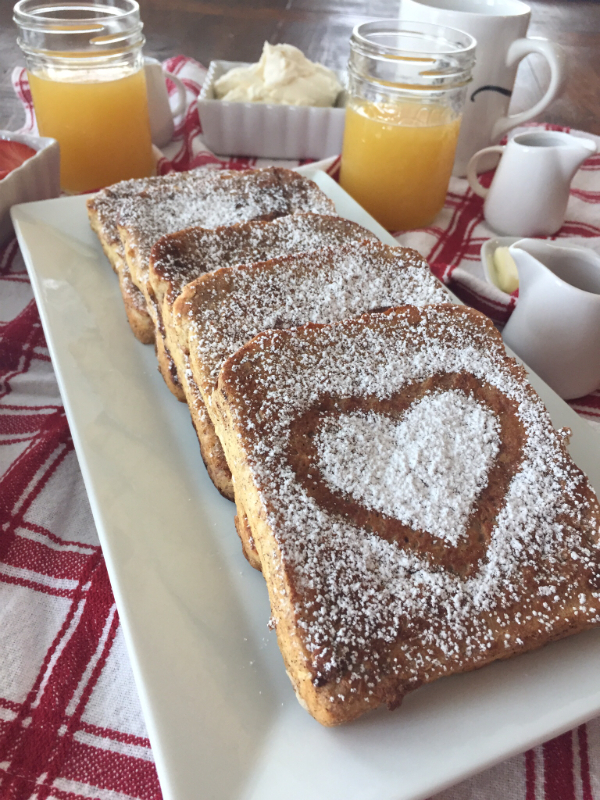 Valentine’s Day is just over a week away, and this year it falls on a Saturday, so what better what to show your love to those in your life but with brunch! I know I’ve said it many times before but I LOVE brunch. 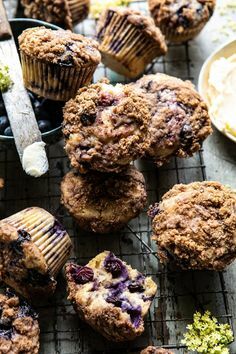 I honestly can’t think of a better way to start off the weekend…eating a leisurely yummy breakfast and drinking some good coffee…ahhhh!!! 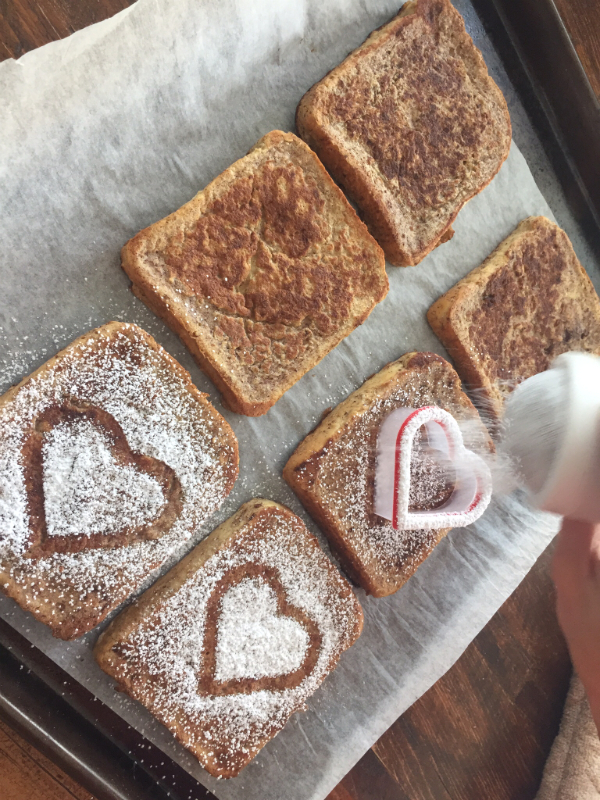 My kids are loving French toast right now, so I created a Valentine’s version. They tested it and all three approved…actually highly approved. You know it’s a good one then! 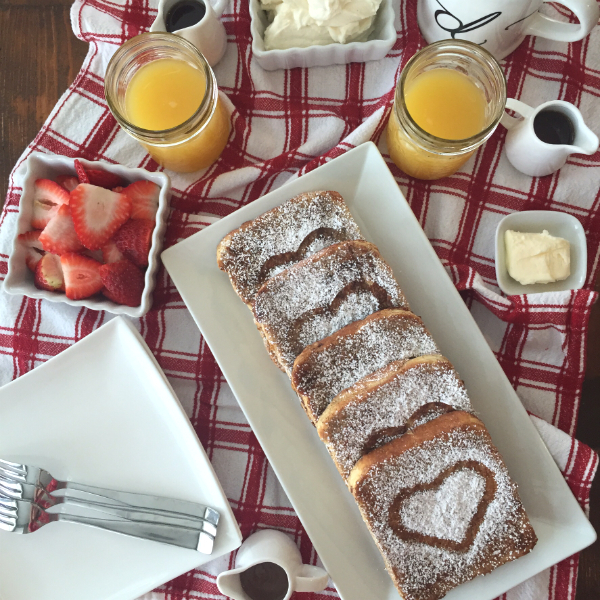 My inspiration came from a French toast demo at the Christmas event at Brambles Bistro. 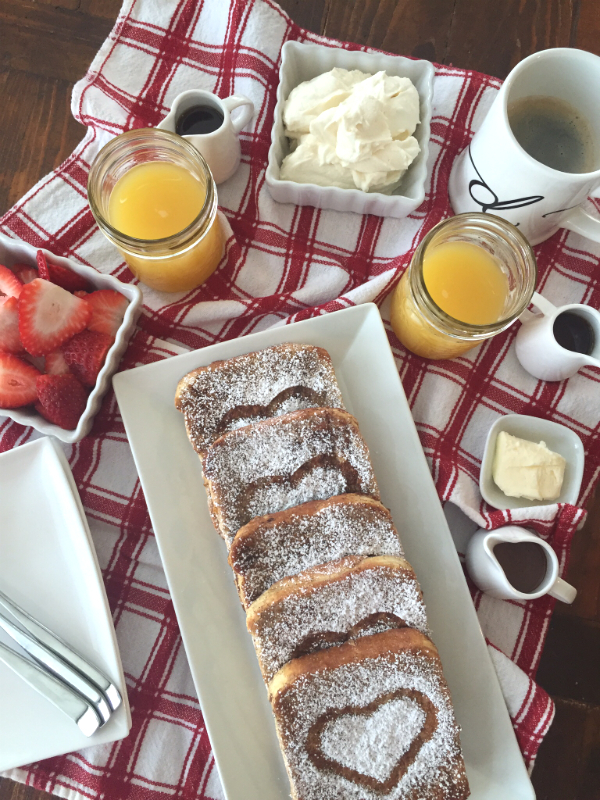 French toast has never been one of my specialties…I have always struggled to cook it perfectly. It’s always tended to get too dark and crispy on the outside before it’s fully cooked on the inside. At Brambles, I learned the secret….finish it in the oven. And it’s the perfect way to get a large batch of French toast cooked at the same time and served up hot for a crowd. Why didn’t I think of that?? Beat together eggs, heavy cream, vanilla and cinnamon and pour into shallow pan. 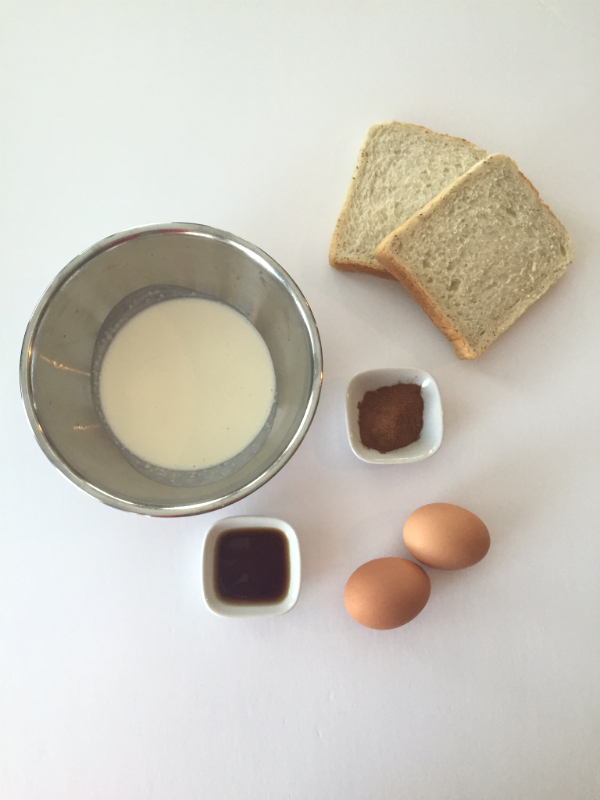 Thoroughly soak both sides of bread in egg mixture. Heat frying pan with butter on medium high heat. Fry in pan until nicely brown. Flip over and brown the other side. Place pieces of French toast on parchment lined cookie sheet. Bake for 7-10 minutes (depends on thickness of bread) until bread starts to puff up and souffle. Place a heart cookie cutter on each slice and dust with icing sugar. Serve with whipped cream, butter, sliced fresh strawberries, maple syrup and "pourable" Nutella. For pourable Nutella, heat up 4 Tablespoons of Nutella in microwave and add 1 teaspoon of coconut oil. You just need a few fresh, simple ingredients for this breakfast. 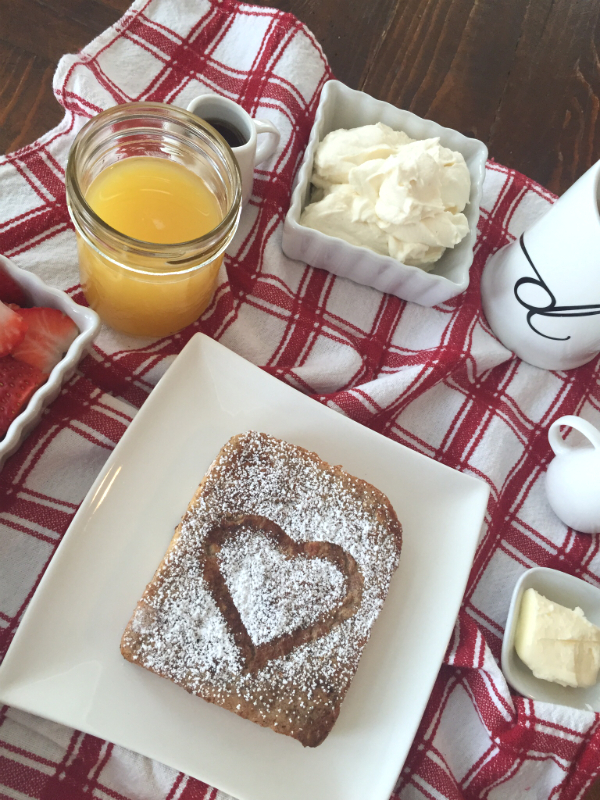 Adding a heart to each piece of French toast is super easy, but makes all the difference. You just need is a heart cookie cutter and icing sugar. Simple but pretty fancy! What my kids loved about this breaky is they could customize the toppings on their French toast. They each like it a certain way. I set out butter, whipped cream, sliced strawberries, maple syrup and “pourable” Nutella. Heat up some Nutella with coconut oil and you can pour it on your French toast…add some strawberries and you’ve got dessert for brunch! That’s the way I like it!